Product #20568 | SKU A-NXT77UV | 0.0 (no ratings yet) Thanks for your rating! 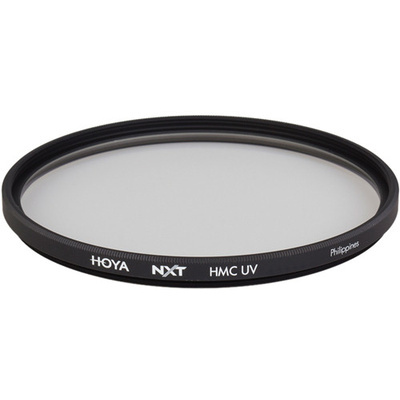 The Hoya 77mm UV Haze NXT HMC Filter is a general use, clear filter that helps to absorb ultraviolet light. No additional coloration or contrast is provided, allowing you to pair this filter with others. The UV filter is also useful as a general protective filter to leave on lenses at all times. Filters help to reduce dust and moisture from reaching your lens element and provide additional protection in case of drops or situations where scratching could occur. Hoya HMC filters are multi-coated for reducing flare, ghosting, and reflections on the filter surface. As a result, over 97% light transmission is possible, providing you with additional contrast and high color fidelity. The UV NXT filters are constructed from high quality, heat-resistant, high-transparency optical glass and a precision milled low-profile aluminum frame.